The Other's War is an intervention into a set of contemporary moral, political and legal debates over the legitimacy of war and terrorism within the context of the so-called global War on Terror. Tarik Kochi considers how, despite the variety of its approaches – just war theory, classical realist, post-Kantian, poststructuralist – contemporary ethical, political and legal philosophy still struggles to produce a convincing account of war. Focusing on the philosophical problem of the rightness of war, The Other's War responds to this lack. Through a discussion of a number of key Western intellectual traditions, Kochi demonstrates how often conflicting and contradictory conceptions of war’s rightness have developed in modernity. He shows how a process of ordering violence around different notions of right has constantly redrawn the boundaries of what constitutes ‘legitimate’ violence. Such a process has consequences for anyone who claims to be fighting a ‘just war’. Building upon this account and drawing upon the philosophical heritage of G.W.F. 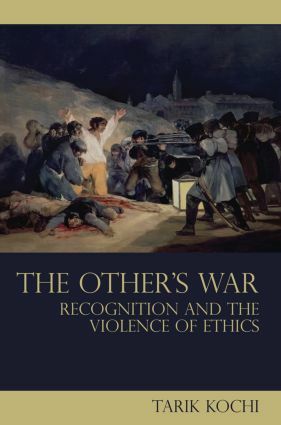 Hegel and Ernst Bloch, The Other’s War proposes a new understanding of war, not just as a social condition characterised by violent conflict and struggles for power, but as the attempt of individuals and groups to realise their normative claims through violence. Kochi argues that both of these aspects of war are an expression of the metaphysics of human subjectivity. War begins with, and is the radical exaggeration of, a fundamental activity of human subjectivity, in which the subject constitutes its normative and material identity; realising and positing itself through acts that involve negation and violence. By drawing consideration of the problem of war back to the level of a philosophical examination of the metaphysics of human subjectivity, The Other's War develops a novel theory of war that helps us to better understand the nature of contemporary conflict as a process of recognition. From this perspective, judgment, it is concluded, needs to be constantly guided by the effort to recognise the ethics of the other's war.